July 1. VF-84 Vagabond Squadron is commissioned at NAS Oceana. The name 'Jolly Rogers' is held by the VF-61 during this time. January - July. VF-84 Vagabonds are stationed on the USS Forrestal during their first major deployment. They fly the FJ-3 Fury. After the disestablishment of the VF-61, a formal request is submitted to transfer the 'Jolly Rogers' name and insignia to the VF-84. The VF-84 are reassigned to CVG-7. They fly the F8U-2M Crusader. April 1. VF-84 formally became the Jolly Roger Squadron. August. The Jolly Rogers are deployed with the F-8 on the USS Independence. VF-84 make two tours in the Mediterranean Sea. VF-84 become equipped with the F-4B Phantom. May - December. Deployed for seven months on USS Independence from 'Yankee Station' in Gulf of Tonkin. They have 1507 combat sorties and log 2200 flight hours during missions in both North and South Vietnam. June 1966 - January 1967. Seven month deployment in the Mediterranean Sea. VF-84 make transition to the F-4J Phantom, and undergo a fifteen month training cycle. April 1968 - January 1969. Deployed for nine months in Mediterranean aboard USS Independence. VF-84 is reassigned to Carrier Air Wing 6 (CVW-6). VF-84 serve on the USS Franklin Roosevelt during four tours with the 6th Fleet. VF-84 revert to the F-4B Phantom. VF-84 make transition to the F-4N Phantom. June 1976 - April 1977. VF-84 train on the F-14A Tomcat. April. VF-84 is reassigned to Carrier Air Wing 8. December. VF-84 make formal transition to the F-14A and the USS Nimitz. The VF-84 Jolly Rogers make their first cruise with the USS Nimitz. The VF-84 Jolly Rogers make their second cruise with the USS Nimitz. During this time, they are filmed in the 1980 movie 'The Final Countdown'. January. USS Nimitz is diverted from Mediterranean to in the Arabian Sea during an Iranian hostage crisis. April. USS Nimitz is used as a launch platform for failed hostage rescue attempt. August 1981 - February 1982: USS Nimitz again deployed to the Mediterranean Sea. During this time, the VF-84 is the first squadron to operationally deploy the Tactical Air Reconnaissance Pod System (TARPS). November 1982 - May 1983. VF-84 deployed to the Mediterranean Sea, including operations off the coast of Libya with no incidents. VF-84 cruise the Mediterranean Sea. August 15 - November 16. VF-84 cruise the NorLant. December 30, 1986 - July 26, 1987. VF-84 cruise around the world. VF-84 make transition to the newly commissioned USS Theodore Roosevelt as part of Carrier Group 8. December 30, 1988 - June 30, 1989. VF-84 cruise the Mediterranean Sea. USS Roosevelt makes makes preparations to join USS Ranger and USS Midway in the Persian Gulf in reaction to the Iraqi invasion of Kuwait. The VF-84 is prepared for combat operations during the fall and winter. December 28. USS Roosevelt is deployed along with USS America. January 16. USS Roosevelt and USS America arrive in the Red Sea. Operation Desert Storm would commences that night. USS Roosevelt is ordered to join the USS Ranger and USS Midway in the Persian Gulf. After arriving in the Gulf, the VF-84 flies in Eastern Iraq during the air offensive and Central Iraq during the ground offensive. The USS Roosevelt moves to Eastern Mediterranean after the ceasefire. The VF-84 later fly missions into western Iraq during Operation Provide Comfort. March 11 - September 8. The VF-84 Jolly Roger Squadron remain the sole F-14 squadron aboard USS Roosevelt in the Mediterranean Sea. June. The United Nations Wars begin as battles start across the globe. 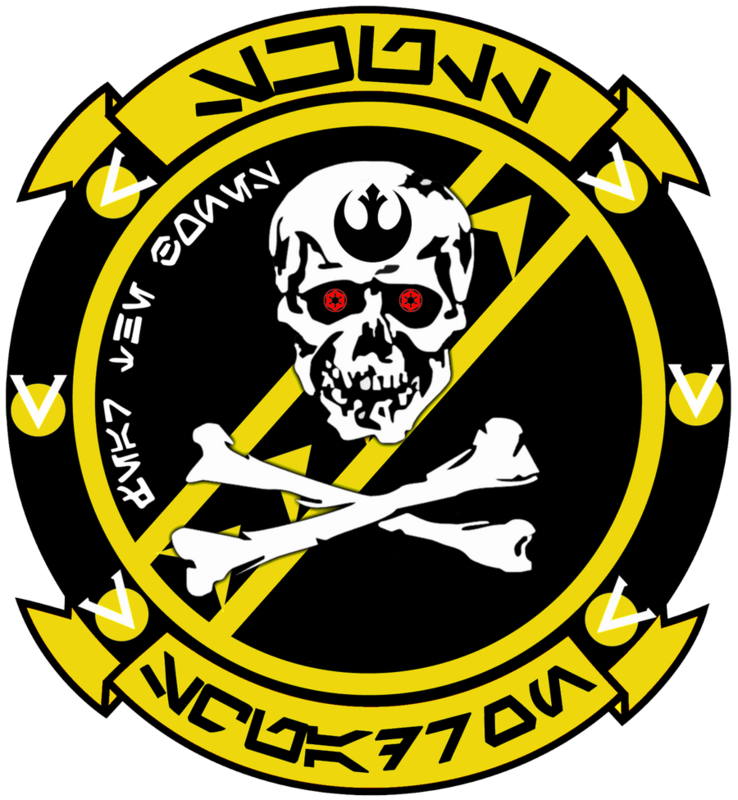 The VF-84 Jolly Roger Squadron, piloting F-14 Tomcats and stationed onboard USS Theodore Roosevelt, are connected to the US Navy during the UN Wars. Over the next several years, the Tomcats are initially upgraded to the F-14A+ Kai, and are later replaced by the F-203 Dragon II in 2003. During this time, the name of the Jolly Roger Squadron is changed to the Skull Squadron and young pilot Roy Fokker joins the VF-84. July 17. The SDF Macross crashes on South Ataria Island in the south Pacific Ocean. The United Nations unify to prepare for alien invasion. (Note that in the Wildstorm comic Robotech: From The Stars, Skull Squadron is stationed on the carrier USS Kenosha near the Macross Island in 1999, and they pilot F-203s at this time). July. Violence in Middle East leads to the resumption of the United Nations Wars. February. Reconstruction of the SDF-1 Macross commences. August. The designing of the F-203 Dragon II begins. The development of the VF-X program begins. December. The carrier CVS-101 Prometheus is commissioned. Skull Squadron is assigned to the vessel. Production of the prototype VF-X variable fighter begins. January 20. The United Nations Wars conclude. June. Skull Squadron test the VF-X in space. November. Mass production of the VF-1 Valkyrie begins. Skull Squadron becomes the first variable fighter squadron. August. Skull Squadron deployed in actual combat in VF-1, although it remains restricted to fighter mode.